Amateur Queens and Kings of GCC are Invited to Compete with the Pros! Today, drag queens and drag kings create a unique art form featuring exaggerated feminine or masculine personas with flamboyant clothing, hair styles and make-up to enrich performances. These acts usually include singing, music, lip-syncing, dance, monologues, skits and comedy that celebrates self-expression, while sharing great fun and laughter. All this is coming to Genesee Community College’s Batavia Campus on Saturday, March 30, 2019. 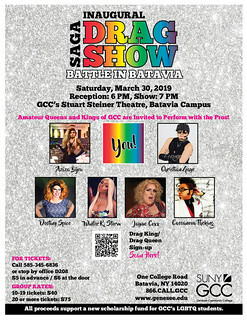 Sponsored by GCC’s SAGA (Sexuality and Gender Acceptance) Student Club, GCC is opening the doors to the Stuart Steiner Theatre not just for a drag show, but The Battle in Batavia—a drag queen and king competition where professional drag artists from Buffalo and Rochester will skirmish amongst amateur drag kings and queens from the campus community. The Battle in Batavia is more than inaugural drag show, though. It is also an important fundraiser to support the College’s first and only LGBTQ Scholarship at GCC. All proceeds from the event will fund this newly established scholarship opportunity which will provide financial assistance to eligible students facing emergency situations, or helping to offset financial hardships by covering the cost books, tuition, child care, or other obstacles to academic success. Only 20 contestants will be allowed to enter The Battle in Batavia, and a first, second and third place winner will be recognized in the following three categories: Professionals, Amateurs and GCC Alumni. Already registered in the Professional category are Jayme Coxx, Christian Gaye and Winter K. Storm of Buffalo, and Aziza Bijou, Destiny Spice and Cassanova Theking of Rochester. Anyone interested in entering the fun-filled competition under the Amateur and GCC Alumni categories can easily sign up at http://signup.com/go/WMQEpto. There is no cost to enter. In addition, several judging positions are also available and anyone interested should contact Kate Trombley, director of the TRIO Adult Educational Opportunity Center and advisor for GCC’s Sexuality and Gender Alliance (SAGA) by emailing kbtrombley@genesee.edu. The Battle in Batavia starts off with a pre-show reception in the Lobby of the Stuart Steiner Theatre from 6 - 7 p.m. where attendees can meet some of the contestants already in character. Refreshments will be provided. At 7 p.m., the Battle begins! Each contestant will perform his or her piece to music of their choosing. There will be two acts, and during the intermission a question and answer session will allow the audience to interact with the stars of the show. Purchasing advance tickets to the Inaugural SAGA Drag Show on March 30, 2019 is strongly advised! A single advance seat is just $5.00 in advance or $6.00 at the door, if any seats are still available. Discounted group rates are also available. A group of 10-19 people is just $40.00; and a group of 20 or more people is just $75.00. Tickets are available by calling (585) 345-6836; emailing kbtrombley@genesee.edu or by stopping by Office D208 at GCC’s Batavia Campus. This show is recommended for mature audiences only as it may include strong language or sexual innuendo. Those not interested in competing, or unable to attend – but would like to support the important cause can contribute as a sponsor or make a charitable donation. In addition, volunteers are being sought to work at the event and will receive free admission to the show. For further information contact Katherine Trombley, director of GCC’s Adult Educational Opportunity Center at aeoc@genesee.edu or by calling (585) 343-0055 ext.6836.